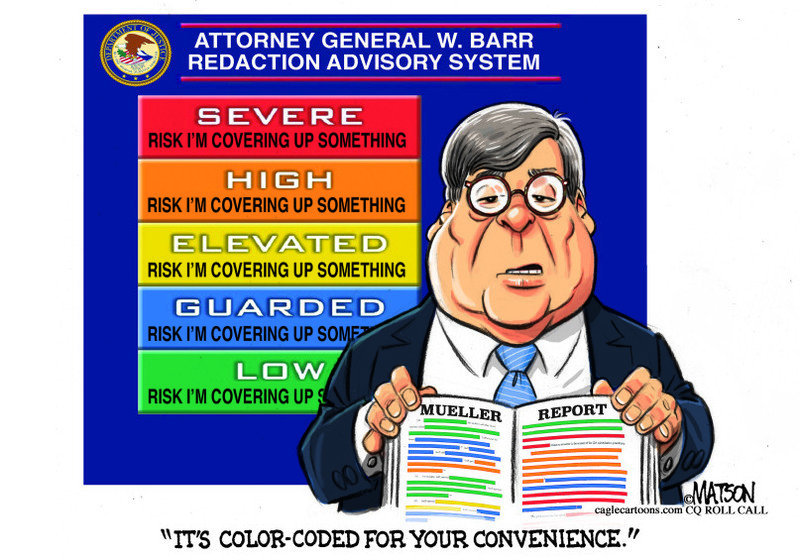 Mr. Barr will release the report after department lawyers [color code redact] secret grand jury testimony, classified information, material related to continuing investigations and other delicate information, said the spokeswoman, Kerri Kupec. Based upon his previous track record in his prior tenure as Attorney General for George H. W. Bush, Barr has a disturbing history of covering up illegal acts by Republican presidents. Barr was the Attorney General who counseled the pardons of those charged in the Iran-Contra Affair. Bush Pardons 6 in Iran Affair, Aborting a Weinberger Trial; Prosecutor Assails ‘Cover-Up’: “Throughout the deliberations, Mr. Bush consulted with Attorney General William P. Barr and Brent Scowcroft, the national security adviser[. ]” “[T]he most significant single act of Barr’s career in the Department of Justice was to advise President George H.W. Bush to pardon six officials from Ronald Reagan’s administration, including Secretary of Defense Caspar Weinberger, for crimes associated with the Iran-Contra affair. At the time, Barr was — you guessed it — attorney general. His recommendation gave Bush the cover he needed to issue the pardons.” Senators, Ask William Barr About His Pardon Strategy. Barr also previously misled Congress with his own “summary” of an Office of Legal Counsel opinion regarding the FBI’s ability to abduct people in other countries without the consent of the foreign state, leading to Bush’s invasion of Panama and the arrest of its leader, Gen. Manuel Noriega. Barr is going back to his old playbook with the Mueller Report. The idea that Barr and the administration would not even discuss the content of the opinion could not withstand public pressure. Barr’s stance was especially untenable because his OLC opinion reversed a prior OLC opinion (an unusual event), and the Justice Department had released that prior opinion in full to the public just four years earlier. The Chair of the House Judiciary Committee’s subcommittee on civil and constitutional rights, Rep. Don Edwards, then wrote to the Attorney General requesting the opinion, but he was rebuffed. An assistant attorney general wrote back. “We are unable to provide you with a copy of the 1989 opinion because it is the established view of the Department of Justice that current legal advice by the Office of Legal Counsel is confidential,” she stated. But there was no categorical prohibition, as Barr himself would later admit in testifying before Congress. The assistant attorney general’s letter itself included one glaring counterexample. “I am enclosing a copy of the 1980 opinion,” she wrote, and she noted that the Department had released the 1980 opinion to the public in 1985. On the morning of Nov. 8, 1989, Barr came to Congress to testify before Rep. Edwards’ subcommittee. 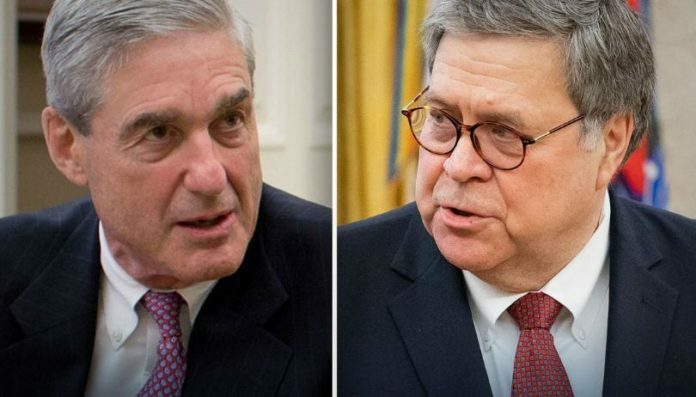 Some of the events that unfolded also bear a remarkable resemblance to Barr’s handling of the Mueller report to date. First, Barr started out by saying that the history of internal Justice Department rules was a basis for not handing over the full opinion to Congress. “Chairman. Since its inception, the Office of Legal Counsel’s opinions have been treated as confidential,” Barr said. That statement was misleading or false, and Chairman Edwards knew it. Barr retreated. “It has been the long established policy of OLC that except in very exceptional circumstances, the opinions must remain confidential,” Barr replied. The reference to “very exceptional circumstances” backtracked from what Barr had just said and what the letter sent to Rep. Edwards by the assistant attorney general had claimed. But even the assertion that OLC opinions were released only in “very exceptional circumstances” could not withstand scrutiny. The Justice Department had shared OLC opinions with Congress on many occasions during the 1980s, as a letter by Rep. Edwards to the Justice Department later detailed. Barr then pointed out his willingness to provide Congress with “our conclusions and our reasoning.” This was the 13-page written testimony which contained a detail recounting of the views expressed in the OLC opinion. Chairman Edwards complained that Barr had violated the rules of the House by submitting his written testimony only that same morning of the hearing, rather than 48 hours in advance. Barr’s timing meant that members of the committee and their staff were not well equipped to analyze or question the OLC’s analysis. But at least they had the OLC’s views in writing. Or did they? Barr’s description of the OLC’s views included that as a matter of domestic law the President has the authority to authorize actions by the FBI in foreign countries in violation of customary international law. I am not the first to notice that Barr’s testimony omitted parts of the OLC opinion that would have earned the Justice Department scorn from the halls of Congress, legal experts, and the public. Over one and a half years after his testimony, Congress finally subpoenaed Barr’s 1989 opinion. Another House Judiciary subcommittee issued the subpoena on July 25, 1991. The administration first resisted, but within a week agreed that members of Congress could see the full opinion. That same month, the Washington Post’s Michael Isikoff obtained a copy of the OLC opinion. The Clinton administration, within its first year in office, then published the OLC opinion in 1993 making it publicly available for the first time. That proposition is a very difficult one to sustain, and as Brian Finucane and Marty Lederman have explained, Barr was wrong. The 1989 opinion ignored the President’s constitutional duty to “take care” that US laws, including ratified treaties, be faithfully executed. And the opinion conflated the so-called political question doctrine, which is about whether courts can review an executive branch action, with the question whether an executive branch action is authorized or legal. What’s more important for our purposes is not whether the 1989 opinion was wrong on this central point, but the fact that Barr failed to disclose this “principal conclusion” to Congress. Professor Jeanne Woods, in a 1996 law review article in Boston University International Law Journal, also observed the large discrepancy between Barr’s 13-page testimony and what it failed to disclose. “Barr’s congressional testimony attempted to gloss over the broad legal and policy changes that his written opinion advocated.… A careful analysis of the published opinion, and the reasoning underlying it, however, reveals the depth of its deviation from accepted norms,” Professor Woods wrote. Barr’s opinion not only failed to apply the Charming Betsy presumption in favor of international law; the opinion applied what might be called a “reverse Charming Betsy.” Barr had reasoned that “in the absence of an explicit restriction” concerning international law, the congressional statute should be read to authorize the executive branch to violate international law. “Because, as part of his law enforcement powers, the President has the inherent authority to override customary international law, it must be presumed that Congress intended to grant the President’s instrumentality the authority to act in contravention of international law when directed to do so,” the opinion stated (emphasis added). That part of the OLC’s analysis has not withstood the test of time. Indeed, there was good reason to keep it buried. Finally, Barr’s testimony failed to inform Congress that the 1989 opinion discussed international law. The OLC’s 1989 opinion took a very different view. It stated, “The text of Article 2(4) does not prohibit extraterritorial law enforcement activities, and we question whether Article 2(4) should be construed as generally addressing these activities.” The opinion also engaged in what many legal experts would consider controversial if not clearly wrong claims about international law. As one example, the 1989 opinion stated, “because sovereignty over territory derives not from the possession of legal title, but from the reality of effective control, logic would suggest there would be no violation of international law in exercising law enforcement activity in foreign territory over which no state exercises effective control.” The fact that the opinion had to resort to such a claim of “logic,” rather than jurisprudence or the practice and legal views of states, indicated its shallowness. In the final analysis, Barr’s efforts in 1989 did not serve the Justice Department well. He had long left government service when the OLC opinion was finally made public. The true content of the opinion, given what Barr told the American people and testified before Congress, remains much to the discredit of the Attorney General. William “coverup” Barr has been covering up the illegal acts of Republican presidents for years. I fully expect him to stay true to form, which is why Donald Trump hired him. The House Judiciary Committee authorized a subpoena for the full Mueller report earlier this month. Serve it Thursday.